I had the pleasure of eating dragon fruit (also known as pitaya) at a dinner party recently and absolutely loved it. So much so that I decided to go buy a bunch of them and try out some recipes. I remember eating dragon fruit many years ago whilst on holiday in Thailand but had forgotten all about the taste. I’m glad I tried it again because it was definitely my favorite piece of fruit on the table at that dinner party (trust me, the table was full with lots of different types of fruit!). Because I liked it so much, I decided to dive deeper in this exotic fruit. What are the health benefits of dragon fruit, where can we find one, and how can we best cut and eat a dragon fruit? How To Cut a Dragon Fruit? Where to Find Dragon Fruit? How to Grow Dragon Fruit? Dragon fruit, also commonly known as pitaya, or pitahaya, is a tropical fruit from a certain group of cactus plants (botanical name: Hylocereus). It is native to South America, Central America and Mexico, and it’s also grown in Asian regions such as Thailand, Cambodia, Philippines, Vietnam and Taiwan. The fruit produced by this cactus plant has a rather short shelf life, but has a delicious and mildly sweet taste. It tastes a bit like a mixture of watermelon, kiwi fruit and a pear. The texture is very similar to that of kiwi fruit, because of the tiny little black seeds inside. These seeds are perfectly edible so no need to try and get them out. Dragon fruit is about the size of a large potato and is usually red (magenta) in color, although they can also be pink and yellow. The flesh inside can be either red or white in color. With its very unique shape and color, it’s pretty obvious where dragon fruit got its name from! Dragon fruit is definitely a fruit that you should try at least once in your life, because it tastes great and it’s also very nutritious. When you go out to buy a dragon fruit, make sure you choose a ripe one. A ripe dragon fruit usually has an even colored skin and feels not too firm and not too soft either. If they feel a bit firm, you can still buy them because you can just leave them at home to ripe for a few days longer. There’s probably many ways to cut your dragon fruit, but I cut it straight through the middle, leaving you with 2 halves. Similar to kiwi fruit, you can then use a spoon to scoop out the flesh. You could also cut it in 4 pieces and then peel or cut off the skin. Please be mindful that the skin is inedible so make sure you don’t leave bits of skin attached to the flesh. Once you have removed all the flesh, simply cut them in little pieces or wedges and serve them on a plate. It’s also a good idea to add chunks of dragon fruit to a fruit salad for a bit more variety in nutrients. A perfect snack on a warm summer day! Check out this fun YouTube video for a live demo on how to select and cut a dragon fruit! If you’re into blending or juicing (like me! ), you can of course use dragon fruit for that too, mixed up with other fruits and vegetables. And did you know that you can also get dried dragon fruit tea in some specialty stores? I haven’t tried that yet but it’s certainly on my to-do list. Dragon fruit is quite an exotic fruit that you won’t easily find in your average grocery store, unless maybe if you live in South-East Asia or Central America. Your best bet would be to find them in Asian grocery stores, where you can also find other tropical fruits, such as durian. You could also try and find it at a large fruit and vegetables market where you can often get a lot more variety. Dragon fruit certainly is healthy and delicious enough to make a trip to your nearest Asian grocery store worthwhile. Did you know you can actually grow your very own dragon fruit? Growing from dragon fruit seeds is probably easiest, but it can take a very long time. So if you need quicker results, it’s better to find quality stem cuttings. Plant the cutting in a large pot with drainage using quality potting mix. It can take a few months before the cuttings start to develop strong roots so please be patient. As the cactus slowly starts to grow, prune the stems, allowing them to branch out further. As the plant grows higher, it’s recommended to support it using garden twine or something similar. Even though the cactus is a desert plant, you still need to water it regularly, about once a week. Once the plant starts to bloom, it can take another month or so before the dragon fruit starts to develop. 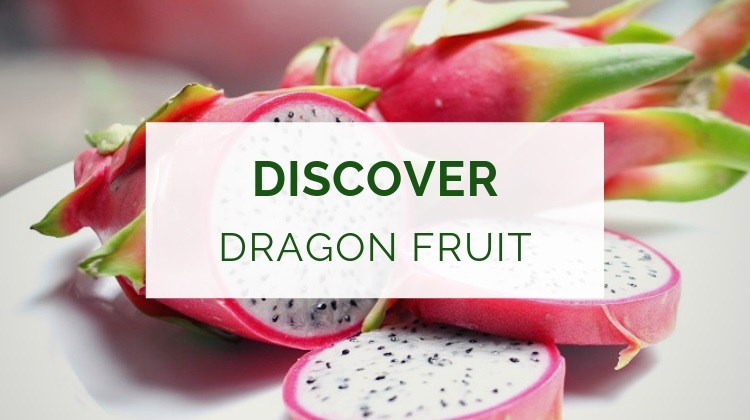 As with most fruits, you can’t go too far wrong with eating dragon fruit. It’s loaded with healthy nutrients, vitamins and minerals, and it’s surprisingly low in calories. Below is an extract of the nutritional profile of 100 grams worth of dragon fruit with some surprising numbers. Antioxidants protect our bodies against free radicals and are essential for keeping our body healthy and in balance. Antioxidants stop the oxidation process, helps prevent diseases, slows down the aging process and promotes healthy skin. Dragon fruit is an excellent source of antioxidants, not just because of the vitamin C, but also because of lycopene. Lycopene is an antioxidant that makes the dragon fruit turn red. Not surprisingly, lycopene can also be found in tomatoes. Although there is no conclusive evidence for this, it is thought that lycopene helps to prevent cancer. Dragon fruit is high in fiber content that promotes healthy digestion and helps prevent issues such as constipation. Fiber can also help stabilize blood sugar levels and therefore help regulate diabetes. We all know vitamin C helps boost our immune system, and although you don’t need dragon fruit specifically to get your vitamin C levels up, it will certainly help. Dragon fruit contains no cholesterol and hardly any cholesterol producing fats. The seeds of dragon fruit actually contain the healthy type of fat which can increase your levels of “good” (HDL) cholesterol. Hopefully you’re just as excited about dragon fruit as I am after reading this far! Here’s a couple of simple recipes that I’ve recently tried out and really enjoyed. As you may already know, I’m a passionate green smoothie enthusiast so I couldn’t resist experimenting with blending dragon fruit with some of my other favorite ingredients. Blend it all together and enjoy this rich and delicious smoothie. Put all the berries and dragon fruit pieces in the yogurt and add a little honey on top. This is a great lunch snack that will give you an immediate energy boost. Tired of eating the same old fruit every day? Dragon fruit is a very exciting alternative to the fruits you’re usually eating. 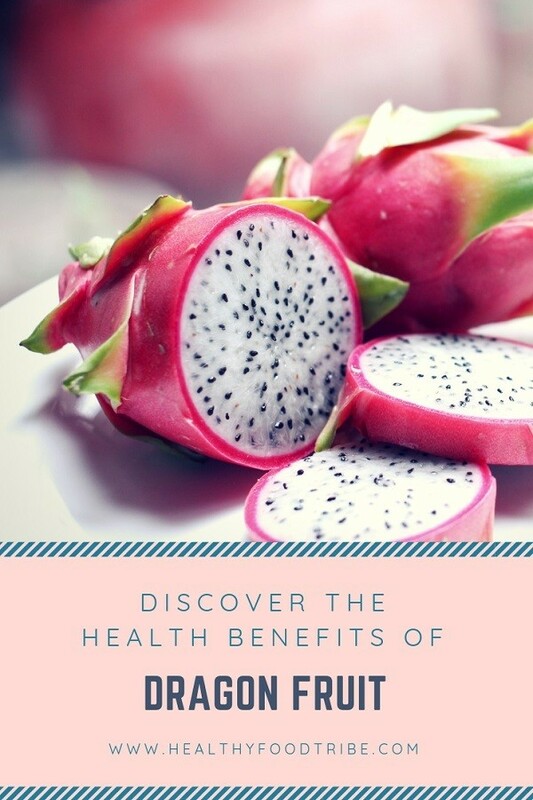 The health benefits of dragon fruit, its taste, and even its looks make this fruit an enjoyable treat, especially in the warmer months of the year. Or read about my experience with the kiwano melon, another tropical fruit with a very peculiar shape and taste. Do you love trying new fruits? Check out my list of 20 exotic fruits that you should try at least once in your life!